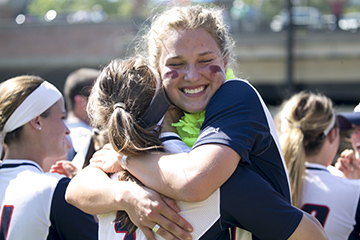 The Samford Bulldog softball team continued its record-setting season by winning the 2016 Southern Conference tournament May 14 with a dramatic 8-inning come-from-behind victory over rival Furman. The Bulldogs entered the tournament as the regular season champions and #1 seed. Furman was the #2 seed. It was Samford’s first championship since joining the Southern Conference in 2008. The only previous championship was 25 years ago in what is now the Atlantic Sun Conference. The Bulldogs will head to Tuscaloosa, Alabama, May 20 to face #4 national seed University of Alabama in a first-round game. Texas State University and the University of California are the other two teams in the Tuscaloosa regional. Friday’s game at 4 p.m. CDT will be telecast on the SEC network.